A normal bridge has two supports, each its own a crown surrounding each one of the supporting teeth, and a false tooth (or teeth) known as a pontic that is suspended in the middle of the two supports. A cantilever is an L-shaped crown which has only one supporting tooth which is crowned, with the false tooth (pontic) suspended on the side. 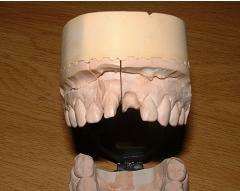 It is used ideally, when one of the front teeth is extracted, so that the mid-line is not bridged. , which interferes with the Cranio-Sacral rhythms. It can also be used when you would have to damage a healthy tooth in order to provide the second support for a bridge. In the first image, a stump is made from tooth 11, then the cantilever-type crown is attached to this stump in the second image. 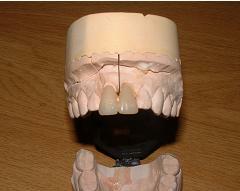 The free artificial tooth is suspended in the open gap, without bridging across the mid-line.